Here are some facts about st Michael’s Mount. St Michael’s Mount is a small island located off the south coast of Cornwall. It is connected to the mainland by a man-made causeway, which can be crossed only at low tide. About 2,000 years ago, the Mount was an important centre of the tin industry. It became an important religious destination and place of pilgrimage during the 6th century. About 30 people live on St. Michael’s Mount. During the early 19th century, almost 200 people lived there, and the island had several schools, and a chapel. The St Aubyn family has lived on the island since the 17th century. 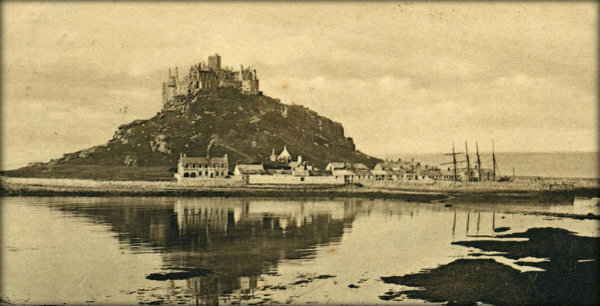 In 1954, the family gave St Michael’s Mount to the National Trust, who look after it to this day. The 12th century castle is known for its library of valuable books, its 18th century tidal clock and its mummified cat. It also has a model of the Mount made entirely from champagne corks. During World War II the Mount was fortified against a German invasion, and the bunkers can still be seen. Some Nazis planned to live on the island after invading Britain. In 1588, the Mount was the first place from where the invading Spanish Armada was spotted. In 1755,an earthquake in Lisbon, Portugal caused the water around the Mount to rise by two metres. St Michael’s Mount is well known for its sub-tropical gardens, with plants from Mexico and South Africa. Some terraces are so steep that the gardeners climb down with rope. The Mount can be seen in several films, including the 1983 James Bond film, Never Say Never Again. It was also used as the outside of Dracula’s castle in the 1979 film Dracula. Legend says that the Archangel Michael appeared to island fishermen in 495. The Mount is said to be located on a ley line, a line connecting mystical or spiritual places. I know a little about many things. I’m able to admit, on this subject, I was clueless. I barely recall 1/20th of this subject. Facinating!